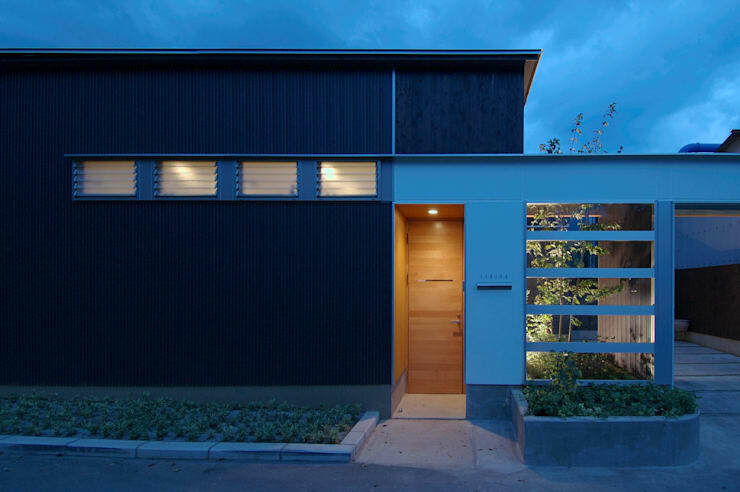 This single story Japanese home is both discreet and offers the occupants generous natural spaces with open abundance. The project was designed by Japanese architects Be Runa and they faced a couple of interesting challenges with the site. The property is in the path of some strong westerly winds and the home was plagued by dust. It's also located along the route of a primary school and the occupants felt there was too little privacy. The solutions here just go to show that a few limitations can be a good thing when it comes to creativity. The owners now have a private home with a great natural area, a small art studio and a bathroom with natural access to a terrace. For beautiful photos and general inspiration, come on a tour with us around this very special Japanese home. This angle offers us a view of the western facade of the home, the facade that received the wind and dust issues. Here we can see how the architect has created a solid barrier against the winds, without turning the home into a fortress. A narrow walkway shields the occupants from the winds as they open the door and prevents random particles from entering. At the same time, a clever series of bands across the internal garden create an open feeling to the facade, without actually revealing much of the interior. To finish the friendly effect, a dark wooden finish offers a natural facade. Here we have the entrance to the enclosed courtyard. The owners wanted an outdoor area with privacy and this area certainly delivers. The courtyard possesses a single tree, and yet it possesses an atmosphere of natural abundance. 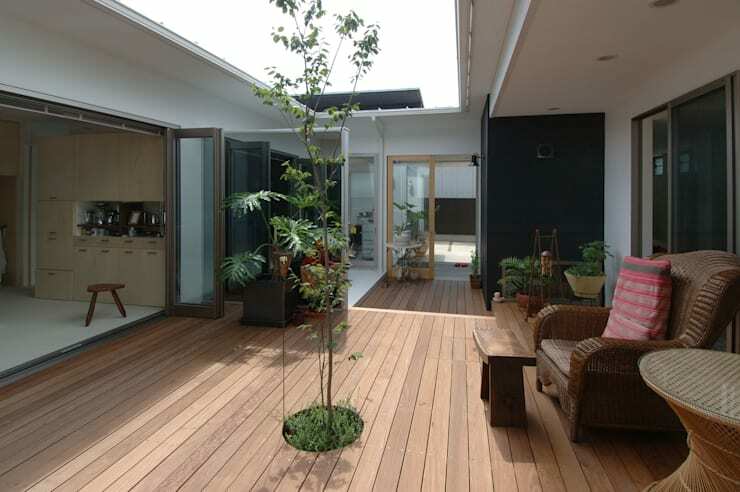 Wooden decking and an open roof mean that this is primarily an outdoor area, but the large sliding glass doors on all sides mean that it's very well integrated with the interior life of the home. 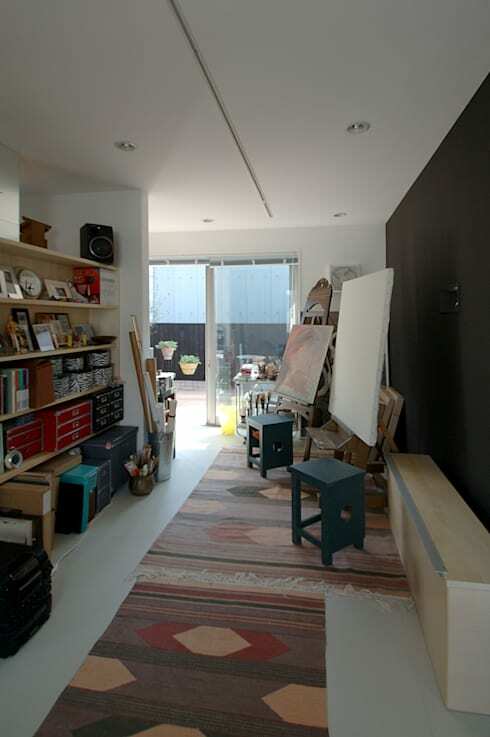 The owner of the home loves to draw and here we can see a small art studio with open access to the outdoor deck. It's a humble studio with small wooden chairs, warm rugs, a low wall, a few shelves and the option to turn towards the natural sunlight. A bright red sofa makes a splash amongst the antique wooden furniture here. It's interesting that the sofa been placed in the centre of the room and not butted up against the wall. This frees the area from the traffic areas of the open sliding doors and creates a small intimate space within the open plan living area. But it's the long, narrow raised portion of the unique ceiling that really catches our eye. The enclosed series of small wooden panels create a symmetry that leads the eye down the length of the room and extends our sense of the space. 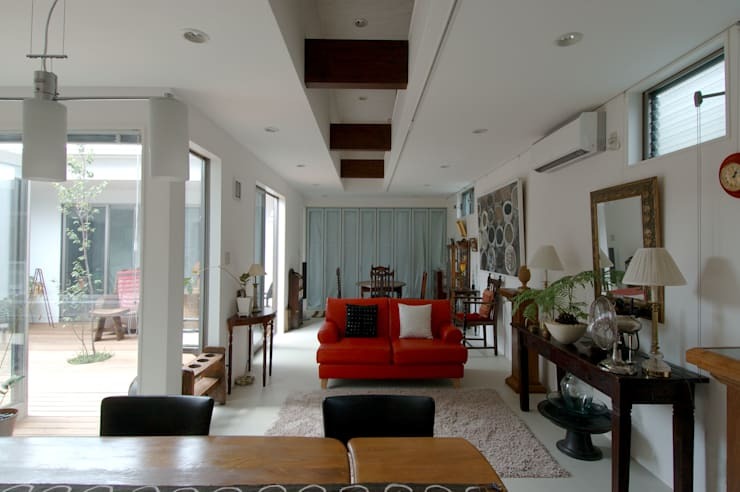 This entire home is only 118 square meters, so it's an effective illusion. Seamless and small, these beautiful white-pebbled bathroom tiles look particularly soft on the feet. 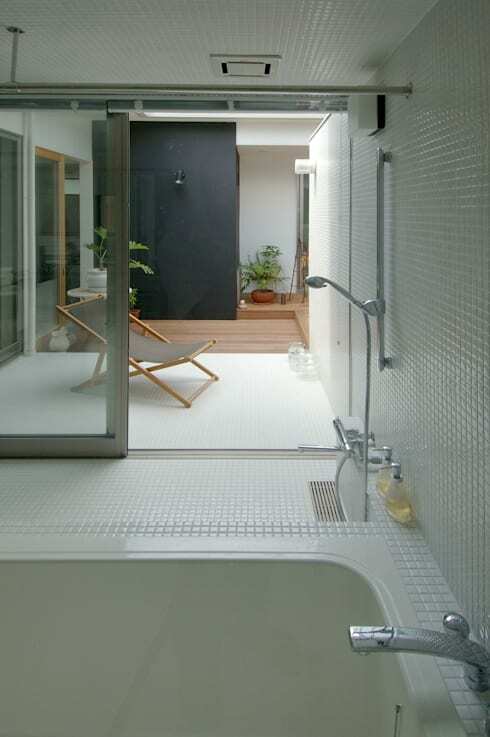 A glass sliding door connects the bathroom to an internal courtyard with a deck chair. If the quiet sumptuous decor of the room isn't enough, note the sunken in bathtub that promises long, lazy afternoon soaks. 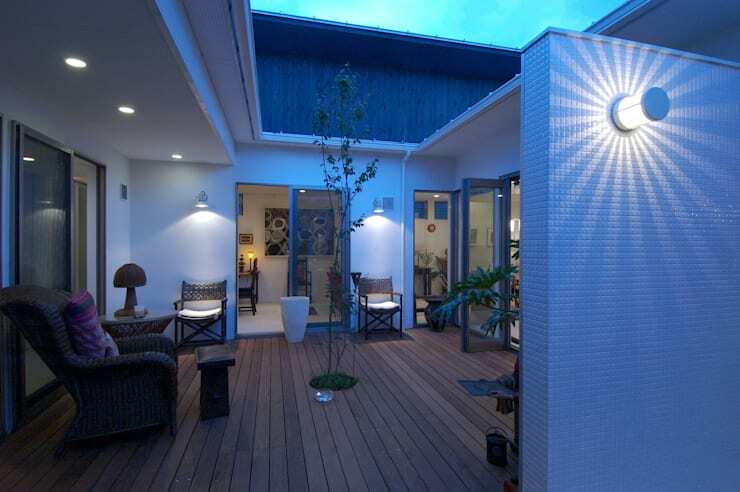 For many people, it's tempting to flood an outdoor area with blazing light or a single spotlight. Here we can see how a few recessed ceiling lights, a couple of downward lamps and a cool, almost 1960s style light fitting, have been used to create a low-light bohemian vibe. The mismatching outdoor furnishings, low tables and a couple of folding chairs make this a place to hang out with a glass of wine. What do you think of the interior garden here? We would love to hear in the comments below.